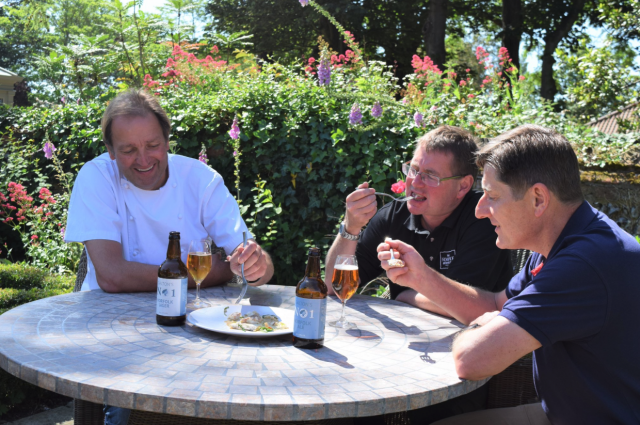 Galton Blackiston, owner of Michelin-starred restaurant and hotel Morston Hall in Norfolk, has launched two beers which he helped to produce, working with local farmers, maltsters and brewers. Blackiston will be serving the two beers – a 4.5% lager and a 4% ale – in his restaurants Morston Hall and seaside fish and chip site No 1 Cromer. Commenting on the launch, he said: “I loved the idea of crafting my own ale and lager to match with our food. “In a region so rich in local produce, food takes centre stage and chefs take a lot of plaudits. The county’s beer and brewers also deserve attention. So do those along the supply chain. That’s why I’ve spent time with the barley growers and the maltsters at Crisp Maltings, as well as with the brewers”. Never afraid of getting hands on, Blackiston worked with the local maltsters Crisp Malt, based in Great Ryburgh, selecting a blend of floor-malted Maris Otter and Clear Choice. The barley was grown locally by the Harrison farming family. He then enlisted the help of Hindringham-based Norfolk Brewhouse and head brewer Bruce Ash, selecting French hop variety Strisselsplat for use in the lager and a blend of seven hops including Mosaic, Azzacca and Cascade for the ale. Blackiston has held a Michelin star for the past 18 years and runs Morston Hall together with his wife Tracy. He has appeared on television numerous times, including on shows such as the BBC’s Great British Menu and Saturday Kitchen. He joins a growing list of chefs making their own beer and paying closer attention to their beer lists, including Rick Stein, Tom Kitchin and Tom Sellers.